On the loop road just past Sparks Lane you will see a parking area for the John Oliver Cabin. 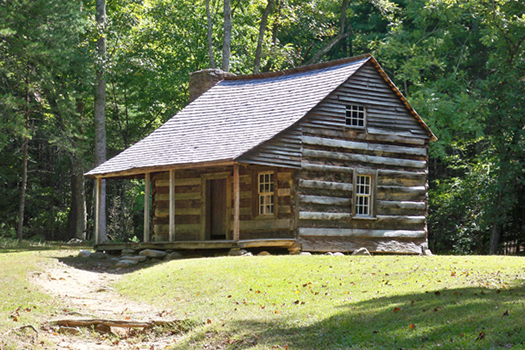 Although it is set far back from the road, this is one of the most visited cabins in the park. 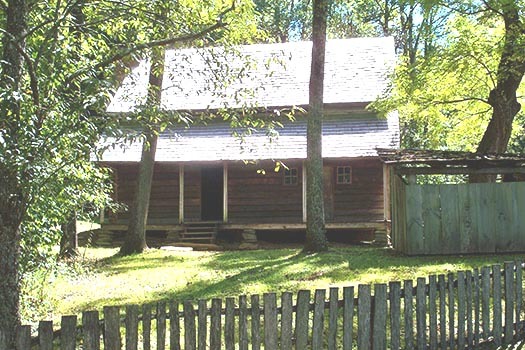 By the early 1850s, Cades Cove was a prosperous and self sustaining rural mountain community with access to the outside world provided by five narrow roads; however, 30 years earlier, when John and Lucretia Oliver became the first permanent white settlers, there was no road into the cove, only a rugged Indian Trail. The trail marked the beginning of many hardships the Olivers would initially face. "I heard my Gran-ma say that she honestly thought she would starve to death," a grandson, William, once wrote. 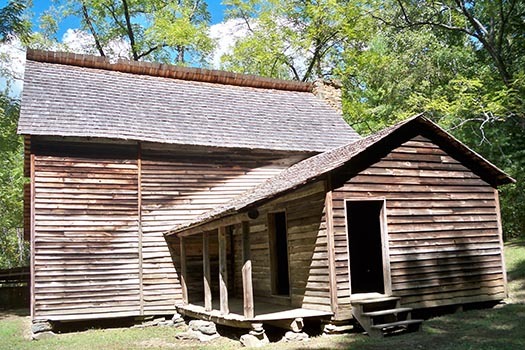 Until there were grist mills, the Olivers had to beat their corn into meal for cornbread using a mortar and pestle. Before moving to the cove from Carter County, Tennessee, John was enlisted as a private during the War of 1812 and had marched with General Andrew Jackson from Tennessee to the Battle of Horseshoe Bend in Alabama. One of the oldest log homes in the park, the Oliver place remained in the family until the park was established. Architecturally, it reflects the techniques and skills of European immigrants and represents a style typically found on the eastern frontier in the mid-1850s. The cabin contains no pegs or nails because gravity locks them together. The open spaces between the logs (chinks) were filled with mud to seal out the rain and wind. The small windows and doors conserved heat and maintained the building's strength.